OneCoin obtains Cyprus account. Singapore bank account frozen? Over the past few weeks affiliates have been complaining about funds frozen in OneCoin’s United Overseas Bank. The status of OneCoin’s bank account with UOB in Singapore however is currently unclear. Rather than use their company name, OneCoin’s UOB account is held under the shell company Vernada Trading Pte Ltd. In related news, on October 21st the Monetary Authority of Singapore added OneCoin to their Investor Alert list. The Investor Alert List provides a listing of unregulated persons who, based on information received by MAS, may have been wrongly perceived as being licensed or authorised by MAS. The list certifies that OneCoin is not authorized or licensed by MAS. Appearing on a regulatory alert list is not good for business and might have prompted the UOB freeze. Suggesting OneCoin might have given up on their UOB account, in the last 24 hours a new bank account has popped up in affiliate backoffices. OneCoin’s latest bank account is with Hellenic Bank in Cyprus. As with previous accounts, OneCoin are not using their company name. Instead, the new Cyprus account has been opened using “Eastern Project Investments Limited”. an account with a regulated financial firm in order to be able to trade financial instruments. 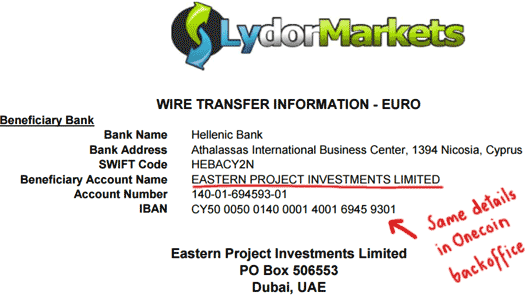 In the case of OneCoin, that appears to be the use of Eastern Project Investments Limited to dupe Hellenic Bank and evade regulators. How long that lasts remains to be seen. In other news, OneCoin’s newly appointed CEO Pablo Muniz appears to be MIA. Munoz hasn’t been seen or heard from since his appointment last month. On a daily basis OneCoin affiliates flock to OneCoin’s social media pages to complain about not being able to sell their OneCoin points (read: withdraw their money). Other than continue to delete these comments, OneCoin hasn’t addressed the long-standing issue. New affiliates are not told of withdrawal problems, with top investors instead advising them to keep their money in OneCoin for as long as possible through incentives like CoinSafe. The backlog of withdrawal requests will likely only get worse, with OneCoin routinely running promotions that double Ponzi points allocated to their investment packages. This is another deal with Frank Ricketts like with his IMS Company..
Yeah. This is such an unbelievable scam. I think even the gang is surprised how far this has come. 6 Billion Euros ? Has there been a bigger Ponzi than this ? Yes there has been. Bernie Madoff took in over $65 Billion Dollars, so they have a long, long, long way to go. They will run long before that, unless the authorities move against them first. Although founded in 1989 and having bankrupted and resurrected itself more times than a feline cartoon character, MMM Global (various) have had between 5-40 million estimated victims who lost up to $10 billion total. Onecoin claims 2.5 MM Members (~95% victims) and revenues of $3-6 billion, I believe. However, those numbers are certainly exaggerated (I mean it’s easier but more time consuming to count the documented lies of the #KleptoQueen and #OneCULT than it is the times they tell the truth). So, I don’t see any reason to believe that those numbers are any less hyperinflation than their fake coins themselves. However, based on the 8 or 9 (?) other collapsed Ponzi scams they have and continue to “partner” with along the way (Bonofa, BNG Intl., WeShares, Unaico/SiteTalk, Conligus, UniverTeam, etc. ), they’re probably around a million jacks propping up the scheme, with another several 100,000 dormant who had already been taken through the ringer in the aforementioned scams and are only numbers in their database – just as any numbers with Euro symbols or dollar signs in front of numbers in their back office account screens will soon be. The killer (for some, literally) will be the amount of emotional attachment connected to the paradigm shift in a new alternative to “legacy banking” which is linked to the disruption potential of cryptocurrencies and the fact that victims actually believe Onecoin IS such a digital money solution. It isn’t and never was planned to be, by design. Amazingly, it was crafted for failure from day one, lacking any single element of technology or innovation, whatsoever. Having been lead down a cheery path of such bright epiphanies and opportunities via half-truths and false promises, and by clever but hardened financial criminals and career con-artists like Ruja, Sebastian and McMurrain; these people are screwed! Couple that with the gradual character-digressing, chameleon-like behavior of such con-men as Ken Labine and Joby Boughey (who may or may not have started off “all bad,” but now have regressed into loathesome scumbags who absolutely KNOW the truth, yet actively shield and deflect even small truths from ever reaching their flock of victims while still culturing them to PRODUCE), the violent impact and financial fallout of this tragedy will be the worst in Ponzi history, I truly believe. AT THE BOTTOM OF THE INVOICE YOU WILL SEE A PAYMENT DESCRIPTION. PLEASE COPY THE EXACT TEXT IN THE DESCRIPTION IN YOUR PAYMENT. DO NOT INCLUDE ANY OTHER INFORMATION OR COMMENTS, AS THIS WILL RESULT IN DELAYS WITH YOUR PAYMENT’S PROCESSING. IF YOU HAVE ANY QUESTIONS, PLEASE CONTACT (removed) FOR MORE INFORMATION. NOW WHEN YOU CHOOSE TO PURCHASE OR UPGRADE A PACKAGE FROM YOUR BACK-END BY USING THE “BANK WIRE” METHOD, YOU WILL RECEIVE A PROFORMA INVOICE. Proforma invoice = prefilled information that removes any mention of OneCoin from the bank wire? Because y’know, this is totally how legitimate businesses operate. cyprus has a reputation for hosting shady businesses and being a conduit for money laundering as an offshore tax haven. i wonder if they will be diligent about hosting onecoin and respond to complaints, or turn a blind eye. but, i will write in to the hellenic bank and hope for the best. joby boughey is flying into vegas, US, early next month for a onecoin recruitment event. inspite of all the big talk about how onecoin was getting regulatory permission to do business in the US, nothing has come of it and onecoin continues to recruit US citizens under the radar. with the london police investigating onecoin, boughey must be finding it difficult to do business in the UK. but escaping the UK regulators to do business under the nose of US regulators seems like hopping from the frying pan into the fire. Oz: Proforma invoice = prefilled information that removes any mention of OneCoin from the bank wire? OneCoin isn’t using it as an invoice though, they’re going to put their shell company name on there and probably some BS service/product being rendered. It’s to stop affiliates (correctly) putting “OneCoin” or “OneLife” on the bank wire, which triggers financial fraud filters and gets their accounts shut down. oz: In other news, OneCoin’s newly appointed CEO Pablo Muniz appears to be MIA. Munoz hasn’t been seen or heard from since his appointment last month. the onecoin state of the nation weekly update on youtube dated 3/11/2016 claims that pablo munoz is currently in the onecoin hongkong office working with fernando rhys [hongkong manager]. munoz had commented on the need to expand onecoin in china in his address to top onecoin affiliates soon after he joined as CEO. hongkong is obviously the platform from where onecoin conducts it’s illegal china business. so, will munoz venture into china to promote onecoin or will he encourage the chinese to illegally invest in his ponzi scheme safely from the shores of hongkong? Interesting note in relation to the USA OneCULT movements: just got off a regular business call with an affiliate who manufactures and operates a BTM (Bitcoin ATM) network here in the U.S.
As an MSB (Money Services Business) registered with FinCEN (U.S. Dept. Of the Treasury Financial Crimes Enforcement Network) subject to the BSA (Bank Secrecy Act of 1971) and also handling the stringent Compliance protocols of his network (meaning that he is responsible for issuing SAR’s [Suspicious Activity Reports] regularly, as required for AML/ KYC (Anti-Money Laundering [at the Federal Level]/ Know Your Customer [at the State level]), he gets physical visits from the Feds (including FBI) semi-regularly. It just goes with the territory when operating an MSB as a bitcoin “Money Transmitter” or service provider. Anyway, last week, he got a visit – which is most often just a “check-up,” and nothing unexpected, other than to chat about and the Feds desire to learn more about how bitcoin works, as well as to share potential concerns they have with new cyber security tools being exploited and people/ organizations to keep “on the radar ,” etc. The fact is that EVERYONE in the REAL Cryptocurrency space is now very much aware of the scam, and the general overview of the FACT that it is a PSEUDO-CRYPTOCURRENCY which poses regulatory risk (by mere association) with the actual Blockchain, cryptographic and other technology requisite to advancements in the space of computer science (in this field). And EVERYONE in the cc space understands the underlying threat which a SCAM of this magnitude poses to ALL enthusiasts and innovators/ start-ups in this industry – which is “GUILT BY ASSOCIATION” (from both Public perception and media/ governmental interest “SPIN”) when this train-wreck unwinds. The “take-away” from this illustration is simply that Onecoin is NOT going unnoticed here in the U.S., by any means. And if my business associate is being asked, out of the blue, more or less, to divulge his opinion on Onecoin (which, of course he did), than we don’t “need” some formal announcement TO KNOW FOR A FACT THAT the SEC & FBI are not completely “in the dark” about what’s going on. I readily authorized him to relay my own private contact information to them the next time they “circle around,” not because I might take enjoyment in opening myself up to any undue scrutiny, but because I adamantly believe that in this case, it’s simply the right thing to do, IF THEY MIGHT BE ABLE TO HELP MITIGATE LOSSES AND FALL-OUT. ruja ignatova has had a baby. video is available on facebook. crypto queen meet my little daughter. ^^as if the world needed more of her scammy genes. but, poor kid is born right in the middle of rujamummy’s international scam. things are going to be tough on the school playground thanks to dear mummy. affiliates are complaining the internal [fake] exchange is down again for maintenance. the exchange was down for most of october too, and even when it was functional affiliates complained they could not trade their coins for cash as the trades ‘expired’. now with the holiday season coming up, expect a lot more downtime for the exchange. there isn’t enough money to encash everyone’s ponzi points. Again and again Onecoin Exchange is under maintenance (coming soon) hahahahaha. Everyone want to sell but there is No selling so they try to hide the scam by doing this every time !!! With a scam of such magnitude, mommy very likely will end up in jail. Who will get the custody of the child? Does the child has a father (not involved in onecoin)? One coin are holding a christmas bash in Sophia, Bulgaria on December 14th. I’m sure they will spare no expenses. Make Tyco partiers look poor? On a separate note, I notice plenty of events in Sweden and Norway (past and upcoming). I hate scams: Do you have a link? Haha, will that be a giant screen running a Shutterstock video on loop for the cult members to gawp at? reh: ruja ignatova has had a baby. video is available on facebook. there is some talk over at murobbs.muropaketti.com about whether the baby in ruja’s arms is real. this is a magical baby which has seemingly appeared out of nowhere, and given that ruja is such a scammy liar it’s difficult to take anything she says at face value. so, i took another look at the video of ruja&child, and something does seem a little odd. the baby is too damn stiff looking. ruja’s hand which is caressing the wrapped ‘baby’, seems to be moving over a ‘hard’ surface. the baby’s knees are bent very stiffly. doesn’t look very natural to me. a loosely wrapped baby like that will give some appearance of softness and mobility? In other news, OneCoin’s newly appointed CEO Pablo Muniz appears to be MIA. Munoz hasn’t been seen or heard from since his……. Hey guys, what is “MIA” means? Baby must be another lie to cover her cocaine story, interpol story and several investigations among different countries, let check this out! I wouldn’t take Angelina Lazar’s book promoting tour so seriously. I don’t know what’s her drug, but she was obviously tripping with delusions of being some kind of Robert Ludlum. In my opinion we should not go to too wild unsubstantiated discussion. It just diminishes the credibility of the relevant OneCoin discussion. Like imo it’s pointless to discuss whether the baby in the video is fake or not. I’d suppose Ruja could even borrow some baby for a minute for the video if it comes to that, so it’s totally irrelevant discussion at this point. Angelina Lazar’s CT articles are wild and totally unsubstantiated. Very bad journalism from Coin Telegraph. That kind of articles may do more harm than good. We need information and discussion which is based on somekind of actual substance and reference links. WhistleBlowerFin: In my opinion we should not go to too wild unsubstantiated discussion. It just diminishes the credibility of the relevant OneCoin discussion. Judging by the comments in that “article” (sounds more like the delusional rantings of an unhinged person), Lazar is a nasty piece of work. Has an extremely high opinion of herself and talks as if she’s a top-level investigator. I have no idea what Coin Telegraph are playing at. There doesn’t seem to be any way to report the posts either. The company is migrating the ONE LIFE EXCHANGE PLATFORM, which is currently unavailable to an entirley new home. XCOINX. This IS THE FIRST STEP FOR ONE COIN CRYPTOCURRENCY TO becoming a publicaly traded company. This will allow One life members to buy, sell and exchange one coins. XCOINXWHAT A JOKE????? The company is migrating the ONE LIFE EXCHANGE PLATFORM, which is currently unavailable to an entirley new home. XCOINX. As expected there is of course hyping about this on Labine’s FB. This platform may make it possible though to allow the public trading sometime in the future. But contrary what Labine thinks, that day will be the end of OneCoin value, when all the “coin millionaires” try to achieve that promised financial independence. It is very possible that it will be the planned endgame for this fraud. Btw. Labine claims on his FB that this is the first public exchange for OneCoin. No. Nowhere in the announcement it says it is a public exchange. But I’m not surprised Labine claims that. OH DEAR TIM TEYSHUM or should i say your real name TIM Curry & OZ how GUTTED are you going to be when this opens now keep writing your lies boys hahahah!!!! It seems OneCoin lost its Cyprus bank account. Wasn’t xcoinx the internal exchange, before it fell apart? And all this does is confirm OneCoin owns xCoinx, a fact they were previously coy about. xCoinx was very much initially advertised as a third-party exchange after every legitimate third-party cryptocurrency exchange rejected OneCoin. No, xcoinx never worked as an exchange as far as I know, until now. It was previously a half baked copy of coinmarketcap’s main page, with OneCoin added there. Yeah it was advertized to be 3rd party site, but of course it was created by OneCoin. Correct. Xcoinx was announced LITERALLY EIGHTEEN MONTHS AGO as an “independent exchange. During that time there was NOT ONE new page ever added or functionality created for it. Since May 15th, 2015 it was a static page. In July they replaced the plagiarized FAQ page taken from Bitstamp with “coming soon” after much attention was brought to the laziness of Onecoin’s verbatim copy of it. Then, on October 1st the whole site reverted too that. Lol. As such, in 18 months, xcoinx took 0 steps forward and literally 2 steps backwards. Lol. My favorite evidence to point to of this was edited back in April by OzDelphi in which scammer boy Ken “WHOOP!WHOOP!” Labine argues about whether it is even an exchange or not with the #KleptoQueen herself, “Dr.” ScRud’ja! So all OneCoin are doing is moving a part of their affiliate backoffice to another domain they own. Why is this news again? Oz: So all OneCoin are doing is moving a part of their affiliate backoffice to another domain they own. Why is this news again? What’s new with xcoinx – deleted comments on Joby Boughey FB. The new exchange is something that can be hyped (which is much needed) and can be used for keeping the faith going among the members. Of course it can’t solve the fundamental problem, that there is not nearly enough demand for buying the scam coins, as there are sellers. But in the OneCoin universe the main points are hype and lies. It’s not public, that is “coming in the future”. Is it a new exchange though? Sounds to me like they’ve just moved the internal exchange from the OneCoin backoffice to its own domain. And anyway, how does that solve the problem of OneCoin not having enough money to pay out every affiliate’s internal OneCoin Ponzi point value? I mean that’s why the withdrawal requests have been denied for months. It’s got nothing to do with where the internal exchange was hosted. I know you reached the same conclusion, just wondering what OneCoin affiliates are crapping on about. I would guess it is somehow improved, probably looks more professional, but these are just guesses. We will see. There hasn’t been much to rejoice lately among OneCoiners. Of course the withdrawal and selling problems have been in the spotlight recently, so they are now taking any “good news” they can, and hype it as much as they can. No matter if they lie doing that, like Labine. Sure, I guess. Get that Bulgarian PR firm they engaged to update the graphics and web design like they did on the OneCoin website. What, we still don’t have enough new investment to pay people out with? Sssssssssssh… hey look, it’s a baby! Awwww, do you member what babies smell like? Oh yeaaah, I member! Member when we used to get paid? Ooooh I mem- wait what? From Labine’s FB comments: Bloggers confused and hit by bomb blast according to onecoiners. I think the only “bomb blast” going on is in the heads of people who think shifting a broken exchange to its own hosted domain is somehow meaningful. Oz: Is it a new exchange though? Sounds to me like they’ve just moved the internal exchange from the OneCoin backoffice to its own domain. 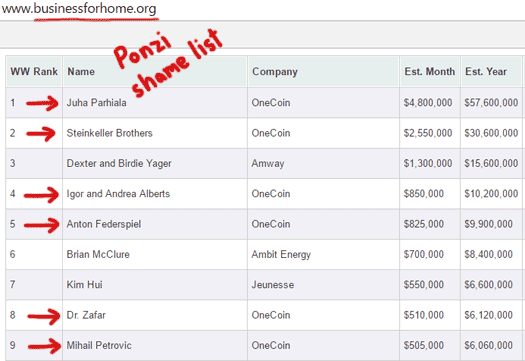 the onecoin backoffice exchange was down for most of october and most affiliates could not encash their ponzi points. now soon into november the exchange is down again on the pretext of shifting to a onecoin owned website as a ‘first step’ to going public in 2018. well, 2018 is miles away and the timing of this shift is suspicious. the festival and holiday season is coming up in december and affiliate withdrawals usually peak at such times. it’s becoming obvious that onecoin does not have the money to honor withdrawals for the most part. as such, the shifting of the ‘exchange’ could provide a ready excuse for keeping the exchange down repeatedly through this heavy withdrawals season, under the pretext of ‘technical issues’. we know that at this time of the year collapsing ponzi’s invent reasons to explain their inability to pay members and this could very well be onecoin’s excuse. Guess we can expect a “hay guys, gunna take us 6 months to move our website” update shortly. doubletree hotel conference room, 2 feston way, london, E16 1RH. some of the speakers are top leaders shiraj, enam, amir ali, ami choudary among others. these guys are stupidly brave enough to go ahead with these events inspite of the london police investigations and being reported on, but it’s fun to know they’re probably shitting their pants all through the event! who knows when the police will show up?? The announcement said you can move your assets (Onecoins or euros) full or partially to the new service. Partially? How in hell is that supposed to be possible? These are supposed to be cryptocurrency coins in a blockchain – does the other service have access to only part of the blockchain? How can you “partially move your OneCoins” between two services that are supposed to be just a UI that allows you more convenient view on what you have in your wallet in the blockchain? Considered on its own, the introduction of this new xcoinx “exchange” is no direct proof that they don’t have a blockchain. I can have three physically separated Bitcoin wallets, one on my laptop, one on my desktop and one on my mobile phone. I can also open Bitcoin accounts at Kraken, Poliniex, Bitfinex etc. And then I can transfer my bitcoins back and forth between my wallets as many times as I want and all transactions will be registered in the (distributed) Bitcoin blockchain. But in this case there is overwhelming proof that everything related to the Onecoin “blockchain” is fake, so your important final conclusion still stands. Xcoinx is still down. I Also noticed they removed the word wednesday from their announcement. People are more and more concerned they got scammed. This is just the beginnig imo. Soon everything will unfold and collapse.